Plymouth City Council (PCC), which is a Labour-run council, chose to implement a 25% cut to Council Tax Benefit on April 1st despite sitting on reserves of £31.3 million when the cut was implemented. 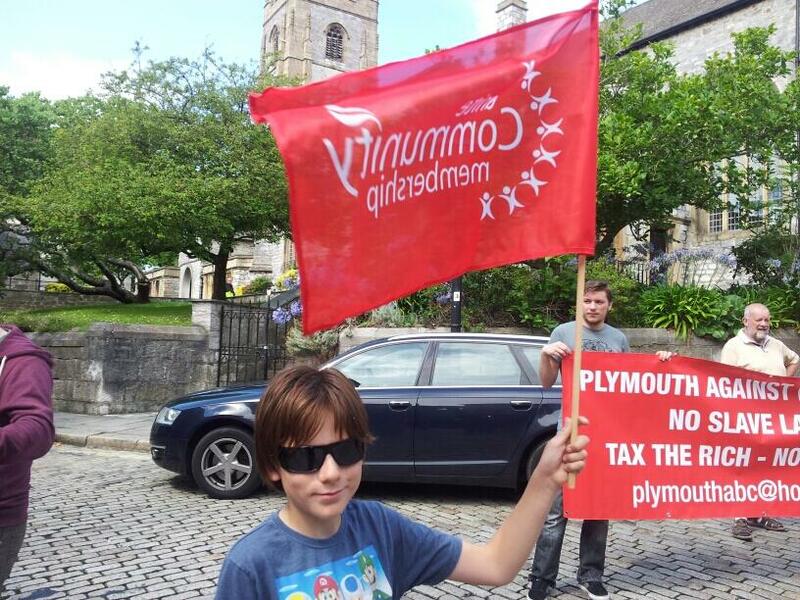 As a result of choosing to safeguard their reserves rather than some of Plymouth’s most poverty-stricken, nearly 8,000 Plymothians have gone into arrears as a direct result of cuts to Council Tax Benefit. PCC issued a mass summons of Plymothians for non-payment of Council Tax on Friday 16th August, the second mass summons since the cuts were introduced. The court hearings were listed for 14:00 and I’m sure the council officers were expecting just another day at the office. What they instead witnessed was a defiant message from people who are just starting to see the benefits of fighting back against these barbarous cuts. 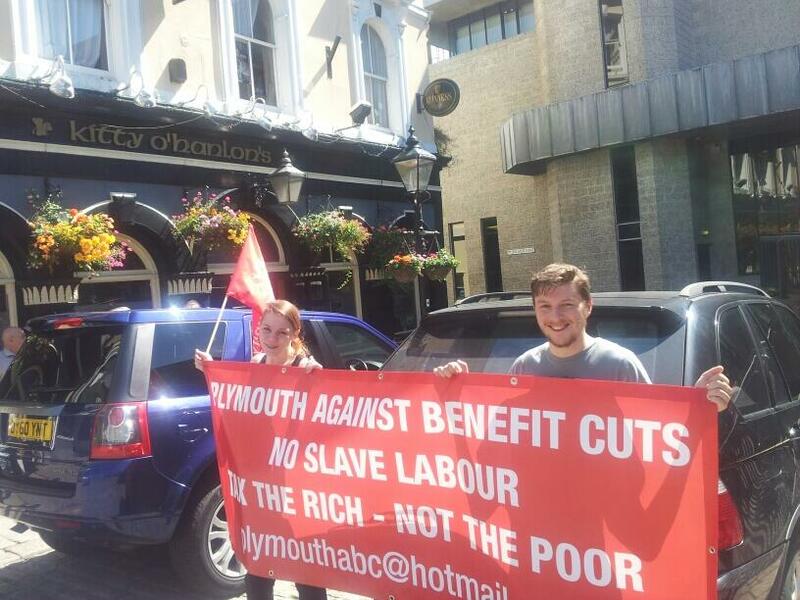 Plymouth Against Benefit Cuts (PABC), the local campaign group set up by Socialist Party members to oppose the Bedroom Tax and cuts to Council Tax Benefit, organised a demonstration outside the court starting from 13:30. More than 25 people gathered outside the Magistrates’ Court in protest, including the local Unite Community Branch, a strong Socialist Party presence, campaigners involved with PABC as well as general supporters and the local press. However, this was only the beginning as 6 campaigners, 1 of whom had been summonsed, went into the Magistrates’ Court to speak to others who had been summonsed. Campaigners encouraged those summonsed to speak out rather than accept that they should plunge themselves further into poverty to pay their council tax, which the Council Officers were more than happy to bully them into doing. The Council Officers, who refused to identify themselves by name, were telling people that they could avoid the court costs if they made an arrangement to settle with the Council Officers outside the courtroom (It has since come to my attention that some of these Council Officers were actually Unite members so I only hope that these Council Officers can work in solidarity with us in the future to oppose these cuts). This would seem like a merciful gesture if it weren’t for the fact that the Council were the ones responsible for dragging these people to court in the first place, instead it has clearly been used a way of intimidating people into paying up. However, when one Socialist Party member who had been summonsed demanded to see the Magistrate others quickly started demanding the same. Not only that but thanks to some leaflets provided by Unite the Union, people were encouraged to use Unite’s payplan service. This is a service provided by Unite to give advice and help for those in debt. By using a debt management service like this, court proceedings have to be adjourned for 30 days which Council Officers were not too impressed about. Many of those who attended court expressed an interest in PABC and want to come along to the next meeting to organise against these cuts. PABC, Plymouth’s Unite Community Branch and the Plymouth Branch of the Socialist Party have all vowed to return every time people are summonsed to court and are prepared to make the implementation of these cuts completely unworkable. Moreover, all 3 groups will be taking the fight to the Council next month as a lobby of the Council will be taking place on Monday 16th September. If Labour do not listen to this outburst of anger now, they are likely to be punished in the polls as the Socialist Party is organising a TUSC meeting in September in preparation for next year’s council elections. 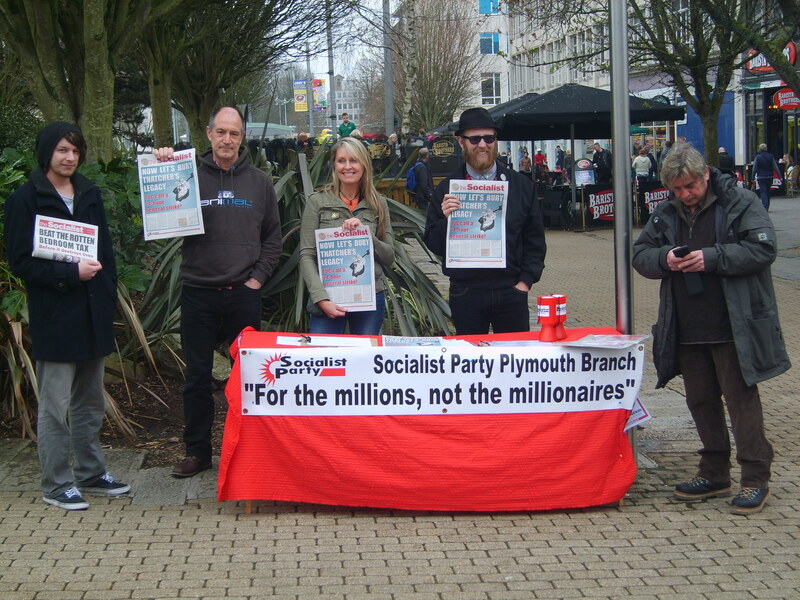 The Plymouth Branch of the Socialist Party is working with the RMT union as well as anti-cuts groups and is aiming to put forward 18 TUSC candidates in the May 2014 elections who will oppose cuts. If Plymouth’s Councillors will not listen to the outcry of those affected by the cuts they have chosen to make then maybe they will start listening as they begin losing their seats in the council. Lenin wrote the April Theses upon his return to Russia in April 1917 and it marked an important shift in the direction of the Bolshevik Party. The main shift was a rejection of the idea that a socialist revolution could only be sought after a successful bourgeois revolution took place, paving the way for capitalism. Essentially, Lenin recognised the idea that Two-Stage theory was flawed and Trotsky’s notion of permanent revolution should be adopted. This would mean that rather than waiting for the establishment of a bourgeois democracy and the development of a capitalist class in Russia, Lenin recognised the need for workers to take control and make demands in their interests directly; to prevent the formation of counter-revolution. In the April Theses, Lenin called for the immediate end to its involvement in World War One due to it being an Imperialist war rather than a war which was necessary for “revolutionary defencism”. Lenin also made it clear that there were many sections of the proletariat who honestly believed that the war was being fought for the purposes of revolutionary defencism. He made it clear that the Bolsheviks should take the time to explain to the masses why they were mistaken in this belief by pointing out their error. This is, in my view, a perfect example of how a vanguard party of the working-classes should conduct themselves. Rather than making a decision on behalf of working-class people and assuming that they will follow, Lenin highlights the importance of engaging with working-class people and bringing them round to our ideas through discussion. It is by doing so that we can remain at the heart of the working-class struggle and not an ultra-left or sectarian faction. With the demand for an end to Russia’s involvement in the war Lenin made it clear that all annexations should be renounced in deed not just in word. This highlights a tactic used by bourgeois parties and bourgeois apologists which can still be seen in mainstream politics today. Labour have said that they are opposed to the privatisation of the NHS, the bedroom tax and anti-union laws and yet they have made no pledges to reverse the changes. The Conservatives pledged all manner of things before the election, one of the most memorable being no top-down reorganisation of the NHS which is now on the road to privatisation. Even the Lib-Dems have betrayed working-class people with similar lies and in doing so have lost a generation of youth voters. Students will not soon forget that not only did the Lib-Dems go against their pledge to end fees for students, instead they have compounded their betrayal by being a part of seeing fees triple. Lenin also called for no support for the provisional government precisely because of “the utter falsity of all its promises”. By exposing the vast chasm between the word and deed of bourgeois parties and juxtaposing it with the conviction of those within the Socialist Party, we will hopefully be able to win over much of the disillusioned working-class masses and encourage them to draw the revolutionary conclusions that are necessary to affect the changes needed rather than putting their faith in the hollow words of political charlatans. Lenin also demonstrated the need to be aware of the objective situation and to act accordingly. He identified that the Soviets of Workers’ Deputies were to form the basis of a revolutionary government but also that the Bolshevik Party were a small minority against “a bloc of all the petty-bourgeois opportunist elements, from the Popular Socialists and the Socialist Revolutionaries down to the Organising Committee”. Lenin pointed out that these groups had all yielded to the influence of the bourgeoisie which has the effect of spreading the influence of the bourgeoisie amongst the proletariat. Lenin stated that it is important that these elements need to be exposed at every avenue while expressing the necessity for power to be transferred into the hands of the Soviets of Workers’ Deputies. It is thus from experience and the critical analysis of revolutionary elements that workers can learn from their mistakes and proceed in a manner that looks out for their interests and not those of bourgeois apologists. This is one of the reasons why we, as the Socialist Party, engage in Trades Councils today. Lenin stressed that to organise as a parliamentary republic would be a retrograde step as the soviets are where the voice of the proletariat resides, not in bourgeois democratic structures. This emphasises, even today, the vast shortcomings of bourgeois political structures in catering for the interests of the proletariat; many leading trade union activists will attend Trades Councils but will rarely, if ever, be seen in the council chambers. This clearly demonstrates where the voice of the proletariat is best expressed in contemporary society. Lenin called for the abolition of the police and a standing army as these are institutions used by the bourgeoisie to repress and restrict the proletariat. Lenin argues that the people as a whole should be armed to protect themselves against invasion rather than relying on a standing army. This may seem like a shocking measure to those of you who are new to revolutionary politics but if you see the way the state has been mobilised to quash protests internationally you will understand the necessity for this call. Even here in Britain, there are plenty of well-documented cases of police using agent provocateurs to stir up violence only to use it as justification to come down hard on protesters. Lenin also called for all elected officials to be limited to the average wage of the worker in order to be able to adequately represent the people they are meant to be speaking on behalf of. This requires little justification and one need only look at the state of the trade union movement to see why this demand is raised. Many high paid trade union officials form a bureaucratic layer who slow down the movement as they are effectively on a boss’s pay and it is in their interest not to be leading an active union as it means more work for them. By pledging to take an average wage leading trade unionists remain firmly in the class of people they are elected to represent and are more likely (though by no means is this assured) to fight for working-class rights. Lenin calls for the nationalisation of all landed estates and the consolidation of all banks into a national bank which is to be governed under the democratic control of workers. This shift of economic control from the hands of the bourgeoisie into the hands of the proletariat would mark one of the most important shifts in the transition from Capitalism to Socialism. This is because it would mean that democracy would no longer be constricted by economic factors imposed by the bourgeoisie. Thus, with democratic control of the economy, society would become much more equal in economic terms as wealth is collectivised rather than hoarded by a minority to levy power over the majority. Lenin draws attention to the need for a new international which would have the function of bringing together working-class people from all over the world. The reason for this is that Capitalism is global in its exploitation and Socialism needs to be global if it is to truly emancipate working-class people. Without the international spread of Socialism, countries will be isolated as Russia was after the Bolshevik Revolution as it is in the class-interests of the bourgeoisie to prevent the spread of Socialism. 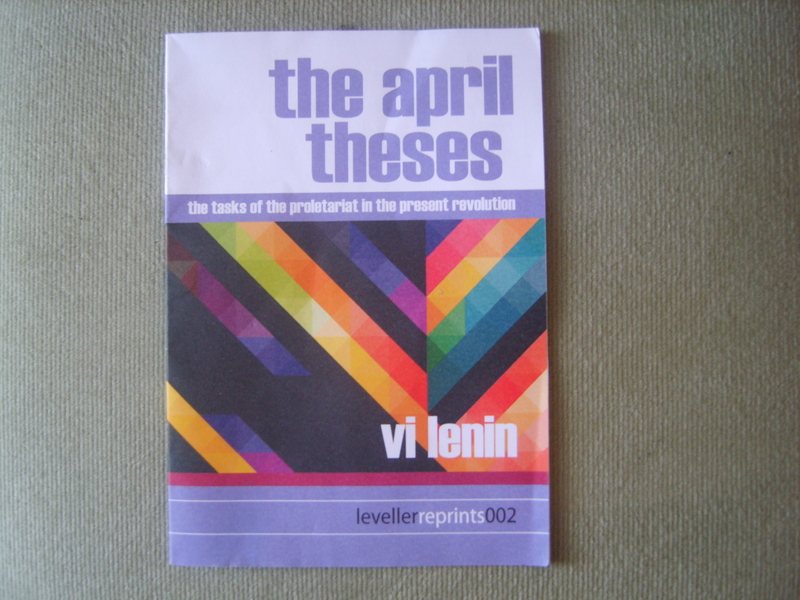 Finally, it is worth pointing out that Lenin’s rebuttal of Plekhanov at the end of the April Theses is admirable in that Lenin takes the time to scrutinise each and every point that Plekhanov raises and then counter these points on an intellectual basis by pointing out the error of his ways. Firstly, a healthy perspective is needed. Lenin once said that Capitalism will always reform itself over the bones of the working classes and I personally think this can be interpreted in two ways. Looking at the poverty, austerity, repression and wars going on around the world today the truth of that statement is revealing itself frighteningly quickly. However, I also see this statement as a challenge; after seeing and hearing some of the grotesque horrors that Capitalism can bring I say that Capitalism can only be allowed to reform over my dead body! I see that same passion and determination driving the CWI forward particularly in sections with only a handful of comrades who stand defiant nonetheless. It is this passion and determination that serves as our most powerful tool of recruitment. It is hard to recruit to a revolutionary party if we ourselves do not first believe that revolution is possible and it is hard to recruit to a revolutionary party if we do not believe that we can recruit. But when we do believe, others will see our conviction and will want to join us and that is simply changed by a change in perspective. I would next say that organisation is key. 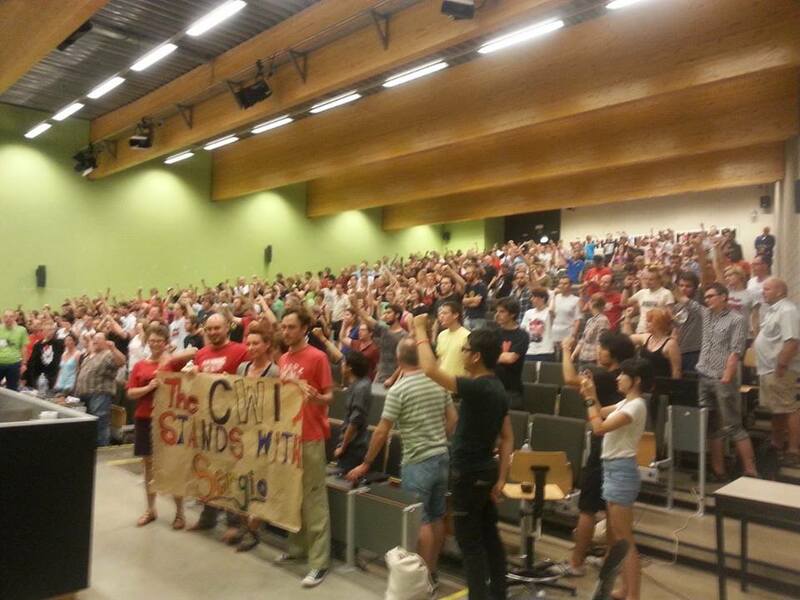 We have a giant task ahead of us with the implementation of socialism across the globe. It requires us to be ambitious and dream of a better future for all. However, as a part of that we cannot allow ourselves to forget the small things which will make the big changes. We should set realistic targets for recruitment, we should organise so that we never lose a contact that we’ve met by misplacing their contact details and make sure we follow them up, not just once but regularly until it is clear that they have lost interest or are ready to join. We should always prepare in advance to ensure that we have the relevant papers and flyers with us for each situation or action, overall we need to be efficient and organised. Next ,I would say we can recruit through persistent action. By remaining at the heart of struggle and showing solidarity with workers as they take action they come to identify with us. They may not join us at first, but unlike bourgeois parties we are not out only for ourselves and we are not like sectarian left-wing parties or ultra-left elements. We do not arrogantly believe we are the leaders of the revolution and expect to drag working-class people kicking and screaming through the revolution. When people see that we stand in solidarity with workers time and time again and do this not just for ourselves but for all sections of working class people across the world, which they will see for themselves through our cooperation and discussions with them, and we should always try to engage in discussions with people by the way, they will join us. Finally, I would say that the endless opportunities Socialism has to offer will inspire and encourage people to join not just after the revolution, but even right now. I, like many people and particularly youth across the world have suffered from depression as austerity has killed any prospect of a prosperous future. With youth unemployment rates in some countries reaching up to 60% many people have, in their despair turned to suicide as they feel constrained, worthless and without hope caused by the failing capitalist system. On the other hand, the party offers hope, productivity, worth and eventually liberty for all working-class people. In the short time I have been with the party I have been a leading organiser, a budding young journalist, a public speaker, even a tourist to Leuven! As well as many more things and that is just me, I’m by no means alone in experiencing these opportunities. I have seen comrades use their creativity to both build the party and express themselves in original and inspiring ways. I have seen this creativity snuffed out far too often by the tyranny of Capitalism but by conveying the opportunities that people can seize through the party, people see their potential and their power. By learning about and building for socialism through struggle and solidarity they grow in themselves and transform, rejecting the worthlessness and failure felt by many and realising that it is in fact the system that has failed them. By helping to change people’s perception from hopelessness, despair and no opportunity to a world full of hope, solidarity and limitless potential, people will be inspired and encouraged to make the revolution their own and by doing so comrades will want to contribute more, whether it be by helping to recruit, contributing to campaigns or increasing their subs when they can afford it. Leon Trotsky was a key figure in the Bolshevik revolution of October 1917 and later went on to become leader of the Red Army. He also formed the left opposition against Stalin. He was exiled in February 1929, however he continued to oppose the policies of Stalin which were highly repressive and led to the deformed workers’ state which Soviet Russia descended into. One of Trotsky’s key works, the Transitional Programme: The Death Agony of Capitalism and the Tasks of the Fourth International has remained a key text of many Socialists since it was first published in 1938. This is for a number of reasons. It is firstly useful as a historical document as it lays out some of Trotsky’s reflections on some of the challenges and conditions the Bolsheviks faced during and immediately after the revolution of October 1917. It also goes on to look at some of the developments in Russia and across Europe right up to the rise of fascism. Even though the Transitional Programme was written 75 years ago there are a lot of similarities that can be drawn between the political and economic landscape of the 1930’s and today especially when looking at the rise of fascism in Greece right now and the economic turmoil faced by much of the Western World. The Bourgeoisie or ruling classes face a crisis of Capitalism as it becomes more and more clear that Capitalism is displaying contradictions which will never be overcome unless there is a revolutionary change in the way we organise our economy. The austerity measures and dismantling of the welfare state are ideologically driven attacks on the proletariat or working-classes of Britain to squeeze profits out of public services by privatising them. This is an attempt to keep extracting profits as a means to keep Capitalism going which Trotsky highlights create the prerequisites to a Proletarian Revolution. This is because, as we’re seeing in contemporary society Capitalism enters into what Trotsky highlights as a blind alley. One need only look at the rising unemployment figures, the dips into recession and the lowering of living standards to see that Capitalism is not sustainable. Trotsky’s Transitional Programme highlights some of the problems faced by the Russian Proletariat which we can certainly appreciate today such as the crisis of Proletarian leadership. While we can see that the Trade Union movement is the most likely vehicle for a mass movement of working-class people due to their democratic and organised structure, we do not take an uncritical approach to Trade Unions. As highlighted in the recent Falkirk incident whereby Unite influenced a Labour candidate selection and have subsequently been turned over to the police, there is a problem of Proletarian leadership. This is due to Trotsky’s notion of petty-bourgeois cowardice being exhibited in Len Mcluskey’s unwillingness to break away from a party that clearly no longer represents the class-interests of working-class people. Trade Unions also face the problem that their leadership is generally bureaucratic in nature and trade union leaders are on wages which are closer to that of the bosses than the workers. To be the leader of a trade union which has no disputes is the easiest job in the world because effectively there is nothing to do, this coupled with their high pay often puts Trade Union leaders on opposing sides to Trade Union members when it comes to the class struggle. I, myself have been witness to the bureaucracy of my Unite union which at best suggests incompetence and at worst suggests bureaucratic sabotage. However, that will only change by affecting change from below within the union and the formation of rank and file organisations such as the National Shop Stewards Network which can levy pressure on the leadership. 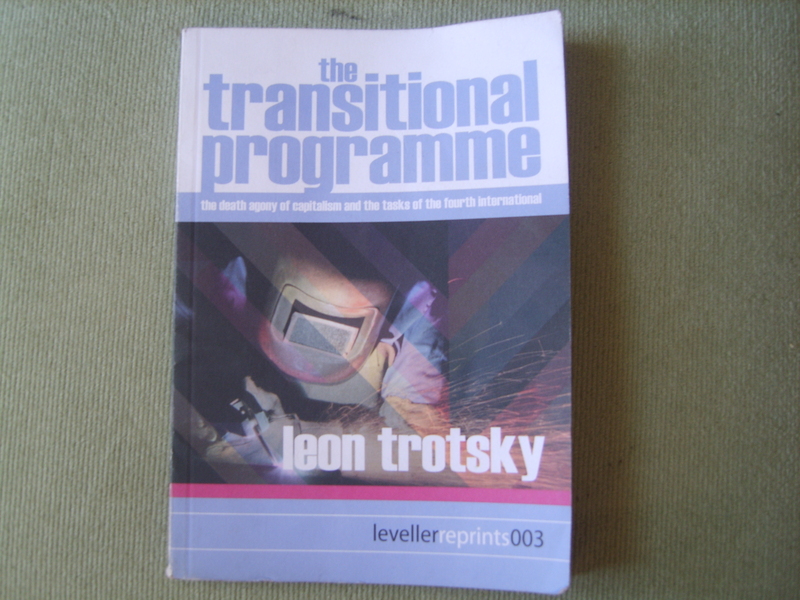 The transitional programme is also certainly worth reading as it goes into detail about the problems of famine faced by the Bolsheviks, the criticisms of the idea of Socialism in one country and also goes into detail about the formation of workers’ councils or to use the Russian; Soviets. The other part of the Transitional Programme which is makes it a key read for any member of the Socialist Party is the Transitional Method which Trotsky developed, which the Socialist Party has adopted. You will sometimes hear the Socialist Party being referred to as a “Trotskyist” Party and it is because we use the Transitional Method as a means to help develop the consciousness of working-class people. Trotsky discussed the idea of a Minimum/Maximum programme and its limitations when looking at the contradiction between the objective maturity of conditions for a socialist revolution and the immaturity of the Proletariat. If one was to run out into the street shouting “Emancipate the Proletariat” most people would think one had gone mad. Likewise, if Socialism is put forward as a way to oppose the bedroom tax it probably would not get very far either as most people would not be aware of the relevance of a Socialist transformation of society unless they are educated in political theory. It is for this reason that Trotsky developed the transitional method, to bridge the gap between the everyday struggles of workers and the goal of the Socialist Revolution. Within this framework, there are three kinds of demands that the transitional method consists of. These are immediate demands, democratic demands and transitional demands. Immediate demands are just that, demands that can be made presently in everyday class-struggle. A good example of an immediate demand would be a call for the scrapping of the bedroom tax. Then there are democratic demands. These challenge the accountability and openness of bourgeois democracy. A call for the opening of the books and an end to Capitalist business secrets would be an example of this kind of demand. Finally, there are transitional demands; these are demands which would attack the bases of the bourgeois regime and expose the contradictions of Capitalism which the bourgeoisie would be unable to satisfy without relinquishing a degree of their power and wealth. With reference to the example of the bedroom tax, calling for the building of more social housing could be considered as a transitional demand. This is because it is based in the everyday struggle of working-class people but calls upon the ruling class to build more housing which would eat into their closely guarded profits, thereby exposing the failures of Capitalism and demonstrating to working-class people their class position and need for education, organisation and mobilisation as a class against a class that is already organised and mobilises against their interests. It is also worth noting that these demands have no set definition as an immediate or democratic demand can quickly become a transitional demand in the right circumstances. For example, demanding that the Capitalists open their books could create a great deal of anger when the obscenity of their profit extraction is juxtaposed to the meagre wages earned by the exploited Proletariat. By putting forward a mixture of these demands Socialists can chip away at the hypocrisies of the likes of New Labour who have compromised themselves by trying to reform Capitalism. It is also by putting forward transitional demands that we expose the economic wealth and power of the bourgeoisie and by working as a vanguard party willing to struggle on the front-lines with all working-class people, we can embolden working-class people not just to defend the morsel of bread which the ruling classes want to deprive them of but to demand peace, land bread and power to the soviets! Election Reflections: A Working-Class That Bites Back First Needs TUSCs! As many of my friends will know, I have been frantically working hard to mount a campaign in the Southway by-election to raise the Trade Unionist and Socialist Coalition or TUSC Party as an alternative to austerity. On Thursday the 27th June the election took place and I attended the count with Sam to see the fruits of my labour. With less than 1% of the vote it could certainly be said that I was underwhelming when it came to providing that alternative. However, I am not arrogant enough to think that I can speak for the working-classes, they have their own voice and are more than capable of speaking up and speaking out when they are ready to. It did of course sting a little that I only managed to muster 22 votes (0.76%) but that means that 22 people did believe in the alternative that TUSC and indeed I have to offer as a representative of TUSC. The 22 votes that I received also needs to be analysed in the wider context of surrounding events. In many ways the working-classes spoke out with a very loud voice; only 29.24% of the electorate turned out to vote. This deafening silence in electoral politics suggests that people have very little faith in changing things through the ballot box. This could be because of apathy but more likely it is because the majority of people don’t believe that there is a viable alternative to the main parties which have all adopted the neo-liberal consensus. This is clearly something that could have affected the votes which TUSC received. However, with relatively few numbers on the ground it is hard to get the comprehensive policies of TUSC across to approximately 10,000 people in a few short weeks. Looking at the voting patterns it is clear that an alternative is being sought. The Conservatives, who had held the seat were relegated to third place in this by-election and the Liberal Democrats received less than 3% of the vote. The independent candidate in the area, who received quite a sizeable vote (10%), suggested that Party politics needed to be rejected. It is clear that the austerity measures have caused an outcry of working-class people who have instead put their faith in Labour, and to a lesser extent, UKIP. This is not surprising as Labour would seem the obvious choice for many as a vehicle to oust the Tories and UKIP seems to be quickly becoming the established electoral protest vote. While this may send a message to the Tories, Ed Miliband has effectively given them the green light to slash and burn the quickly shrinking remnants of the welfare state as he has said that cuts are unavoidable and will not be reversed by Labour. 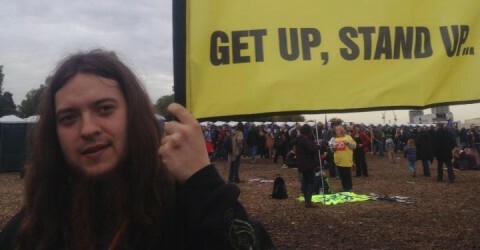 People may have elected Labour in resistance to Tory callousness but Labour are hardly what one would call a resistance seeing as it is hard to nail down exactly what they would be doing differently to the Tories. The Council in Plymouth has been Labour-led for some time now and yet we still have cuts, we still have the bedroom tax, we still have council reserves in the multi-millions and a population which is gradually seeing living standards decline to the point of almost universal poverty. I have questioned the council on a number of occasions about what they plan to do regarding issues which are having a severe impact on Plymothians and I’m generally met with long-winded responses about how the council is facing tough times but they are doing the best they can. Nevertheless, the bottom line is that the council continues to sit on piles of money while people face cuts to benefits that they desperately need as the unemployment rate remains sky high, the bedroom tax is still being demanded of the poor and vulnerable, the bailiffs are being prepped to collect council tax debts and the city centre looks more and more like a ghost town with more shops closed than open, except of course for the corporate tax-dodging giants. The issue of UKIP is also of great concern. While they are seemingly being brandished by the electorate as a stick to bash the mainstream parties with, by giving support to UKIP working-class people are making a rod for their own back. Every member of the UKIP election team that I spoke to was an ex-Tory member. For a Party that is posing as an alternative to the mainstream it doesn’t seem to have anything to bring to the political table other than more cuts and changes which would damage rather than boost working-class families. Not even the Tories have tried to tax those on the lowest incomes 27% of their wage, something which UKIP would do with their flat rate tax which would mean everyone paying the same percentage of tax whether you’re a bin-man or a banker. The Party has come under fire countless times due to bigotry, racism, sexism, homophobia and some very outlandish and draconian views on certain issues. This is also the Party whose “esteemed” leader has been caught dodging taxes by setting up a trust fund on the Isle of Mann. All in all UKIP seem to be a caricature of the Parties that they claim to be opposing rather than a viable alternative to austerity. This is the first time that TUSC stood in the Southway ward and I’m sure it wasn’t helped by the fact that the Herald seemingly forgot to publish my reasons for standing and my photo in the paper when the other five candidates were featured the day before the election. I appreciate the time they took to publish articles online about me and would like to say thanks to Sian Davies who put a lot of work into covering this election but I do wonder why I was not featured in the newspaper. I do wonder what the result would have been if I had got that little bit of extra publicity but it is pointless to wonder what could have been. As much as it seems underwhelming to have only received 22 votes, the TUSC campaign received incredible levels of support from working-class people. With such a short amount of time to mount a campaign, we found it difficult to get our leaflets out to the whole ward and have enough time left over to do some canvassing. The few people we did manage to talk to quickly warmed to our stance of no cuts and the Socialist Party has gained a number of contacts to help our party grow. There is also the fact that in such a short space of time so many people did their best to help out where they could. I don’t have a great deal of links in Southway but so many of my friends supported the campaign in any way they could. I have had friends advertise my election campaign material in their places of work, friends spread my Herald articles all over facebook and helped to distribute leaflets and talk to the people of Southway, Tamerton Foliot and Widewell. The Socialist Party have been stalwart supporters and contributors of this campaign and I am so glad to be in amongst their ranks. I have no doubt that in the elections of May 2014 when 18 council seats will be up for grabs, TUSC will really hit the ground running, particularly as all Plymothians will get the opportunity to vote, not just in a ward that TUSC is only just breaking ground in. 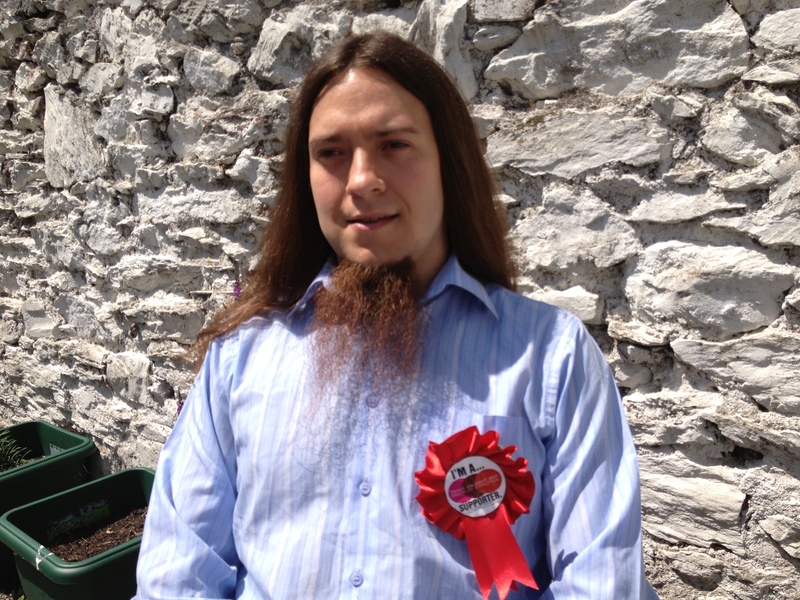 If you would like to know a bit more about where my passion stems from and if you would like to meet like-minded people who believe that there is an alternative to austerity then why not come along to the Socialist Party Plymouth Branch’s meeting on Tuesday 9th July at 19:00 at the Plymouth Social Club (Tavistock Place, behind the Central Library). 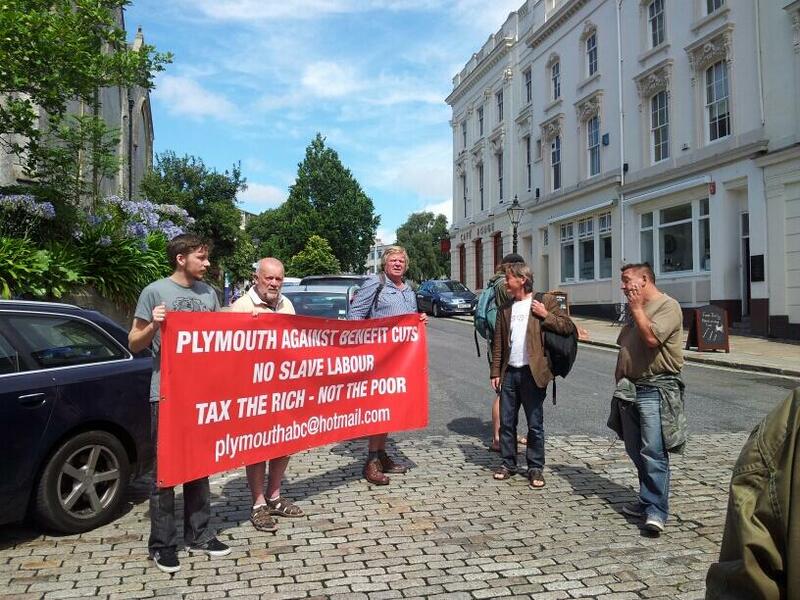 The working-class people of Plymouth, and indeed nationally, need to make a stand against the Parties that have left them behind and forced them into poverty with austerity measures while protecting the tax-dodgers and bankers. They need a party made up of workers, who will campaign on issues that affect workers. I would like to give thanks to Jeremy Guise, Tony Staunton, Sam Taylor-Wickenden, Clare Lattimore, Aimee Clayton, George Fidler, Keith Low and Tom Taylor for helping out with the election campaign. I would also like to give a special thanks to Justin Pollard, Louise Alldridge, Karl Wesemann, Tom Sloman, Rob Rooney (my election agent), Alex Moore, Nigel Buckley and last, but by no means least, Steve Merritt for the superlative efforts you all put into supporting this campaign and keeping me going throughout this hectic few weeks. I have thoroughly enjoyed working with you all to build a collective alternative and it was great to see new comrades join the fray, jump straight into action and come back hungrier for more each week. I shall leave you all with this: If working-class people are to really bite back at the greed, corruption and ideology which is making them suffer, what they need is TUSCs! 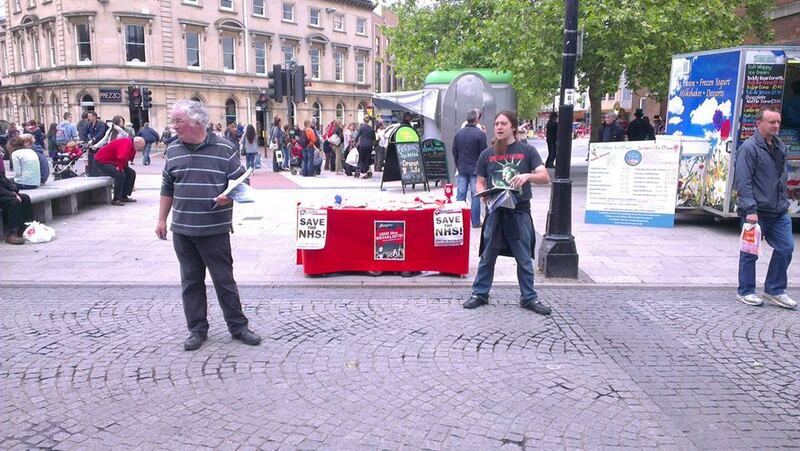 We live in austere times and it shows; we assembled in Taunton to spread the word of Socialism on Saturday 15th June and were incredibly well received. Comrades from Bristol, Exeter, Taunton, Tiverton and myself from Plymouth, got together to highlight that there is an alternative to the crippling austerity faced by Britain and indeed much of Europe. After many conversations with frustrated people, it was clear that a number of people in Taunton are ready to explore different avenues; avenues which mainstream media and politicians have always tried to demonise or ridicule. There are many frustrations in Taunton on a range of issues, spanning from youth unemployment to the bedroom tax to the privatisation of the NHS. 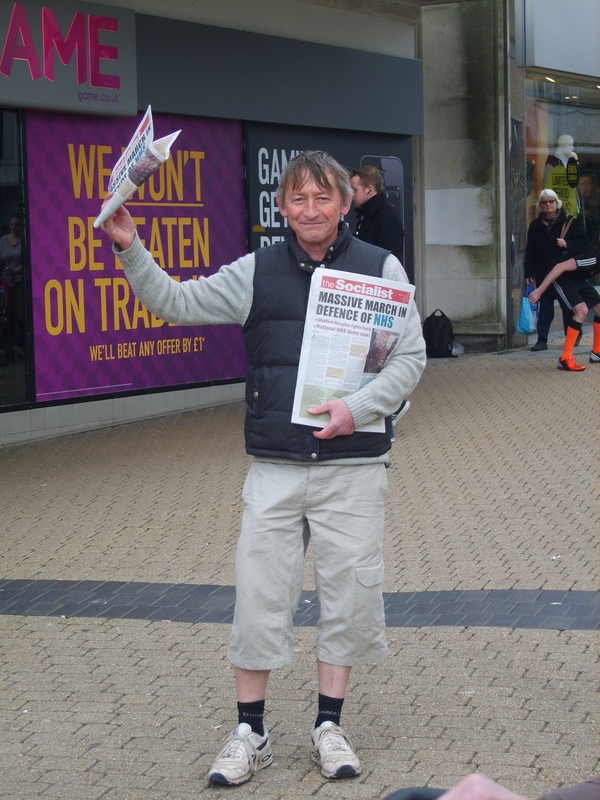 Within one Saturday afternoon in the heavy rain, high winds and then glorious sunshine we picked up a wealth of contacts who were keen to participate in the building of a new mass workers’ party and stand defiant against a government that has left them behind in the pursuit of profit. The following Wednesday we held our inaugural Socialist Party branch meeting in Taunton which was well attended. After 2 hours of discussion on “What We Stand For”, led off by Jim Thompson, people were hungry for more discussion and everyone in attendance were keen to organise another meeting to continue exploring what Socialism has to offer. Taunton will be holding another branch meeting on Wednesday 3rd July with Steve German, the driven and committed branch secretary ready to hit the ground running with an already optimistic group of individuals. I have no doubts that the Taunton branch will quickly flourish and join a whole host of branches in the South West as we build an alternative to cuts, cuts, cuts that will put the needs of millions of people before the greed of a select few multi-millionaires. I also look forward to the results of the upcoming council elections in the Southway Ward by-election which I am standing in. I am standing on a platform of no cuts and hope that people can resist the hollow promises of the mainstream parties to deliver anything other than more austerity and posturing on issues which are having harsh consequences on the everyday lives of Plymothians. You will have to forgive me for my neglect of this blog over the last month or so, I’ve been incredibly busy writing a different story out in the streets and this blog has been woefully unattended. Due to the chaos of my life right now though, I have plenty of things to write about and so I hope you will continue to enjoy my sporadic posts. It is in these times of intense struggle that I have come to build much stronger bonds with my proletariat brothers and sisters. This has led to some of my friends really coming together to provide support and encouragement for me as I hope I return in kind. For example, there is nothing quite like an expertly prepared meal produced by a clear genius of a cook after a long day’s campaign work, a decent glass of wine and the fine company of such a wonderful comrade. My thanks go to Nigel (pictured above, on the right), it was just what I needed to recharge the quickly draining batteries. I have been overdoing it a little this week due to my election campaign for a seat on the Council in the Southway ward. However, a good meal, some great conversation and a place to crash when my strength fails me, leaves a man wondering what could wealth and riches possibly offer me that I would want over these things that have made me feel enriched in spirit. 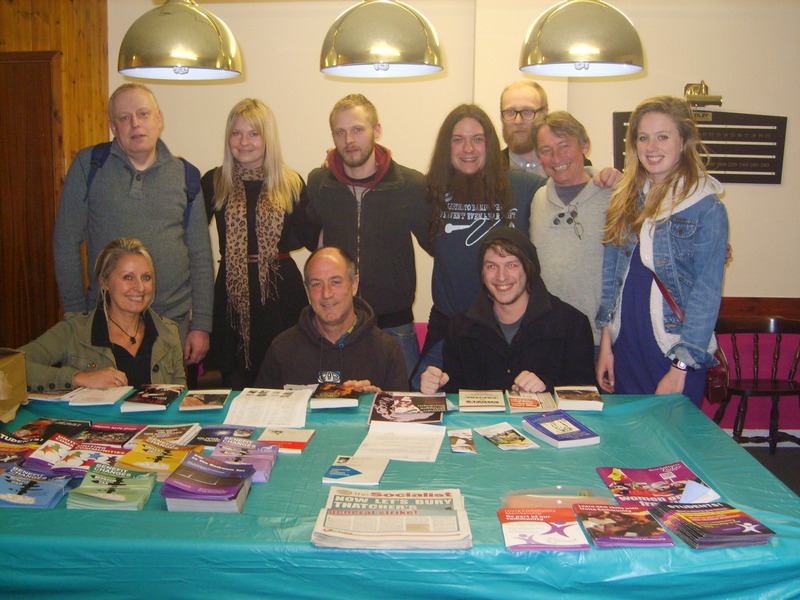 My thanks also go to Rob (pictured above, second from left) who is my election agent in the upcoming elections and has already made a sterling effort in spreading the ideas of Socialism in the ward in which I’m standing as a Trade Unionist and Socialist Coalition (TUSC) candidate, long before I’ve even had chance to step foot in the ward! It is at times like this, with enduring and relentless struggle that a true sense of camaraderie comes about. In this sense, I would also like to thank George (pictured above, kneeling in front of me) for his kind words, there is nothing more confidence building than hearing such kind words of praise from a comrade that I hold in the highest of regards. Lou (pictured above, kneeling on the far left) has also been an inspiration with her bubbly personality and commitment to getting stuck in! I have also appreciated the company, compassion and concern of Steve, another comrade who I’ve yet to capture on camera! 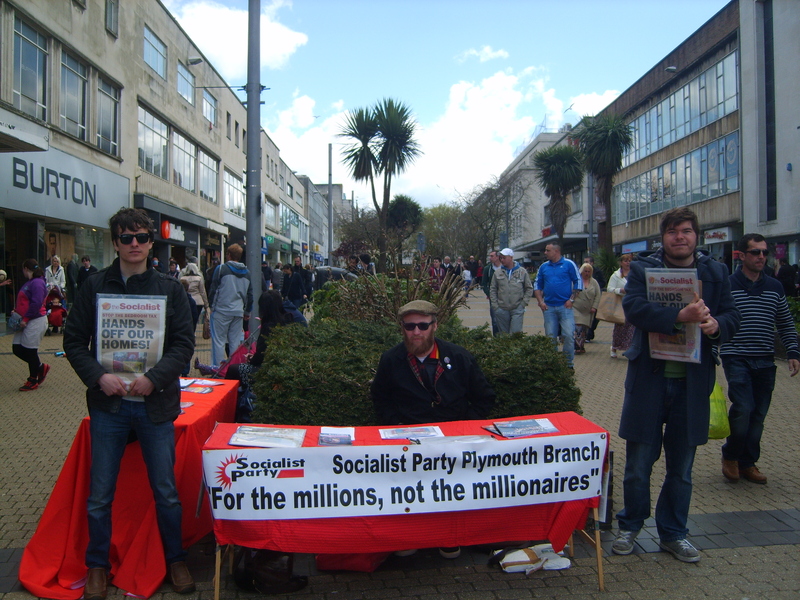 My thanks go to Alex (pictured above) Branch Chair and Justin (pictured below, front and centre) Branch Secretary, for being two inspirational leaders of the Plymouth branch of the Socialist Party. I shall continue to show my appreciation through hard graft and an iron resolve. 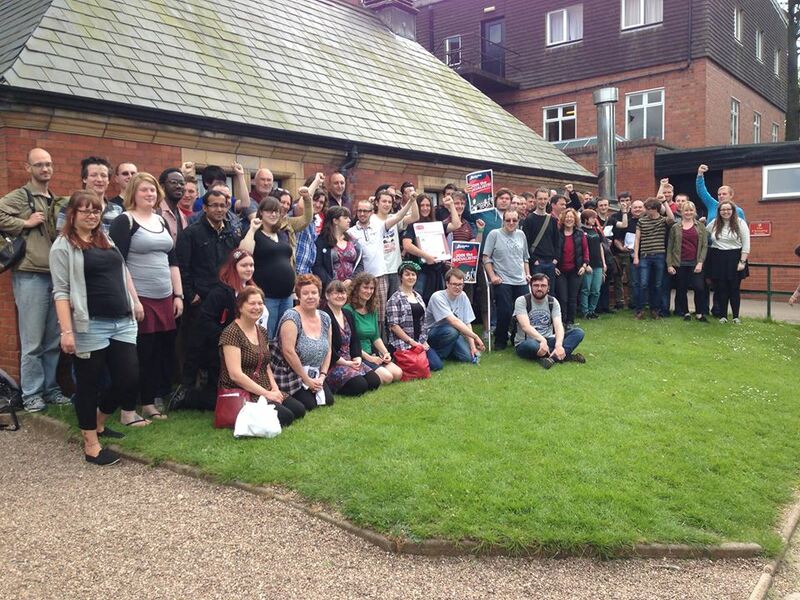 Finally, I shall leave you with a picture of the 90+ Socialist Party comrades, all stood together after an intense weekend of training for the future struggles that the working classes are destined to face. If you feel isolated in your desperation, take comfort in seeing a party of workers thriving. Guided by ideology, a sense of justice and fairness for everyone we hope to be joined as people reject mainstream political parties for their betrayals to working people. We need change and we need to build it together. Let us, the workers of the world, unite! P.S. As much as this has been a political post I would also like to thank Karis in a personal capacity for putting up with my incessant political diatribe, I am looking for the brakes to slow down Karis, but until I find them I shall continue to frantically push buttons to see what happens!